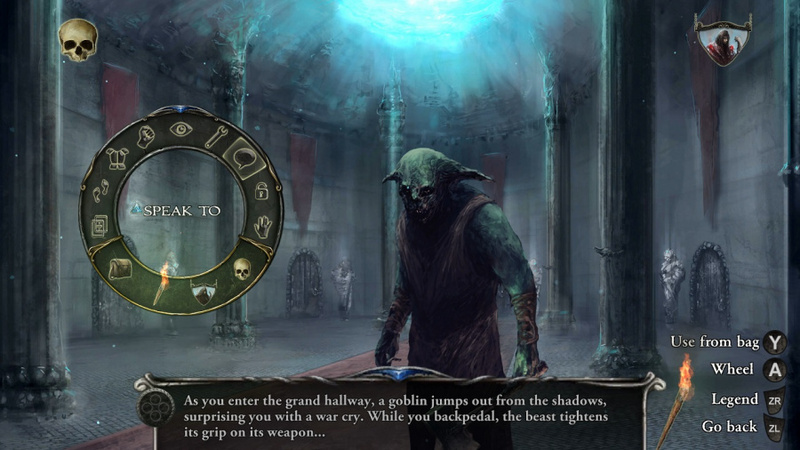 As a hero from a dwindling line of kings, you’ll need to enter a castle twisted by the machinations of a warlock who wants to raise a powerful demon from the depths of the underworld. It’s classic ’80s dark fantasy to a tee and when paired with the gorgeous backgrounds of this modern remake - which look like concept art come to life - the world of Shadowgate is finally given the choose-your-own-adventure atmosphere it so richly deserves. It also makes it a little more palatable to modern eyes. Shadowgate is constantly trying to bump you off this mortal coil, but once you’ve mastered the simple rules of contextual item inspection, use, and combination there’s a great sense of satisfaction to be found amid its interconnected chambers, caverns and dungeons. 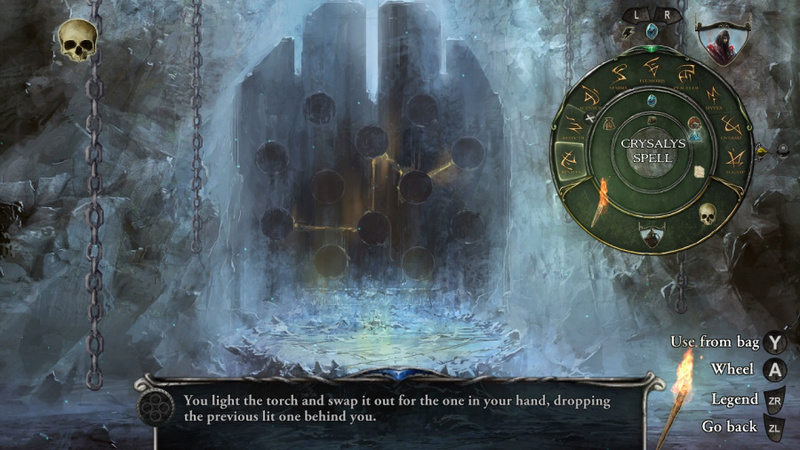 Some puzzles have been added and others extended in complexity, but for the most part, the mechanical bones of the original game have been preserved. Three decades ago, this kind of ultra-obtuse puzzle design was far more acceptable, but now some conundrums are so utterly devoid of logic that it's easy to miss something vitally important a few rooms previously. This remake does include four difficulty modes - including the ultra-merciless Ironman mode (disabling saves and requiring you to finish the game in a single run) - and even includes the option to switch back to classic pixelated transitions and reinstate the Hiroyuki Masuno chiptunes created for the original NES port. It’s a shame you can’t flip back to the classic visuals, but these little extras prove this really is an adventure for fans of the original who like a heavy dose of retro and nostalgia with their gaming exploits. However, Rich Douglas’ new score offers a fine alternative that does the grim fantasy setting plenty of justice. But does the Grim Reaper still wait to catch you? Game sounds like an 8/10 for fans of the genre. I'm definitively interested in lighting up a torch for this! I remember this one back on the NES. It’s certainly a classic that is fondly remembered, but it’s a shame that they went for this art style in the remake. It looks like every other shovelware adventure game on the IPad. I’m sure it plays better and has more depth, but the screenshots don’t sell it well. Holy crap! I had this way back on the NES. Never did complete it but this time around I wont be defeated so easily! @NotTelevision Not a problem for me as I don't own any Apple products! It's so incredibly stupid how some people keep calling Adventure Games "point and click" games. Imagine if we called fighting or other games "move control stick and press button" games. It is a silly description that does not respect the genre which started way before there was even a mouse or anything to point or click with. Should have just released the original; I'd buy that in a heartbeat. @dumedum It is the way to differ textadventures and graphicadventures with text parser from the later adventures you just need the mouse and no text input. The name at least tells what they are. In difference to the special scrolling fighting games called „brawler“. Nearly shat my pants as a Nintoddler back in the days, while playing that game on NES. Effin' eery. @vanYth Yeah, still have Shadowgate 64: Trials of the Four Towers in my N64 collection. Was a neat first person adventure at the time and is unlike anything else on the platform. The graphics were on the blurry side but the atmosphere and mystery was there. I needed a guide for the final puzzle though. These games are hard. 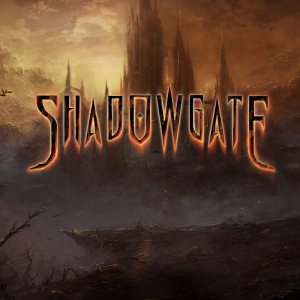 @vanYth @SKTTR I picked up shadowgate 64 about a year ago without knowing very much about it and thought it was fantastic. Its a really great ~6 hour game to power through in a weekend! Loved the NES version! I do want to play this but it will have to get in line with the dozens and dozens of game I have and still want. I mean seriously, Square decides to release not one but 2 massive rpgs this month. One is technically 2 games in one as well. Although I'm sure X2 can mostly be ignored. I haven't even beat Vll or lX yet either. The Bad it's eShop when the original was on a NES cart. How is that a ReMake??? ReMake should be also on Physical cart being faithful to the original NES. @Zach1122 agreed adventure games can apply to more genres but that came first in think and then people used it for other games ... They should come up with a more respectful descriptive name . This just rubs me the wrong way like it removes the thought process the enjoyment part, the story of it, and it becomes some kind of boring puzzle pointing and clicking. 6/10? this is a 9/10 game! An all-time favorite of mine. I hope one of the boutique publishers decides to pick this for a physical release. But chances are I'll have to wait for the 8-bit Adventure Anthology from LRG instead. I played this on the Gameboy Colour when I was a kid. It took me ages to solve everything, the music was great but I'm not sure about the updated graphics in this version. I played the Game Boy original and the excellent Nintendo 64 sequel. I've got this one on Mac but I've never played it, never been much for computer gaming. Might need to pick this version up. Edit: Changed my post since Shadowgate 64 was the third in the series. This remake also ends with a sequel hook which the developers have so far not followed up on. @Sabrewing Dang, good catch. I wonder if it's any good. Looks pretty decent. Let's remake them all! Or at least re-release. @SwitchForce The NES wasn't actually the "original". 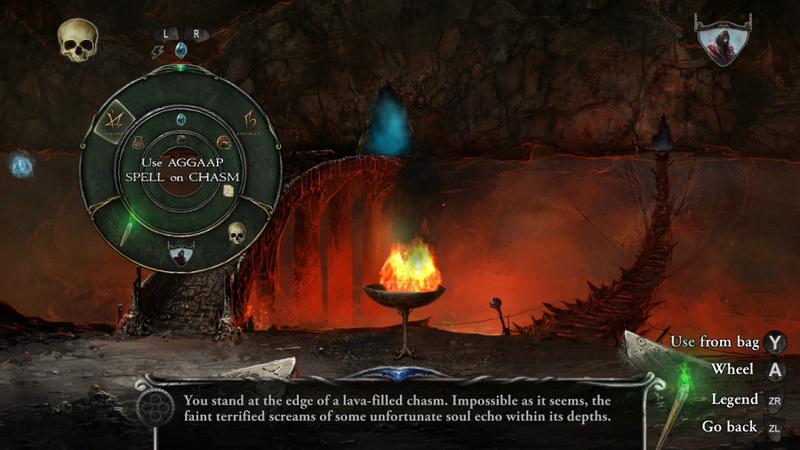 That was on the Mac, hence why Shadowgate and its two spiritual successors were called "MacVentures" by fans. The N64 game wasn't a remake. More like a sequel. And it had its fun, but the original was legendary. Tough and creepy. It gave me the chills even with its chiptune music and old 8-bit graphics. So... is this pretty much like an interactive Fighting Fantasy book? If so, I will give it a shot. It looks very intriguing. I crowdfunded this game and did so proudly. I absolutely love it, honestly. It's also cool to have my name in a game from a franchise I played with my dad for so long. Though, I wish they never changed the UI from the old bar at the top of the screen to the click-wheel that was made to suit mobile devices. That was /not/ an upgrade. @KingMike even then the NES was on cart so if they made it for cart that would make it a worth while to collect. Would really like a physical release of this to go along with my GBC copy. Loved the NES game. Had some creepy music in parts. Can you still beat it in 5 minutes? @Ooyah You could call it a video game take on the infamous Dungeons & Dragons module "The Tomb of Horrors". @Lionyone Agreed, the review doesn't read like a 6. Might give it a go if it's cheap enough! I had this on the Amiga, back in the early 90s. I had no idea it had a cult following, and that it was remade. May give it a shot if the price drops to a single digit. They should've focused less on a faithful remake and more on fixing the archaic game mechanics and overall toning down the difficulty level. I'll definitely pass. A classic on the NES for me. I can only hope Univited and Deja Vu could get a similar treatment, the other two Kemco-Seika NES point-and-click releases. I'd rather just play the original NES game, though kudos to the devs for including the option for the original NES soundtrack! Nice touch. 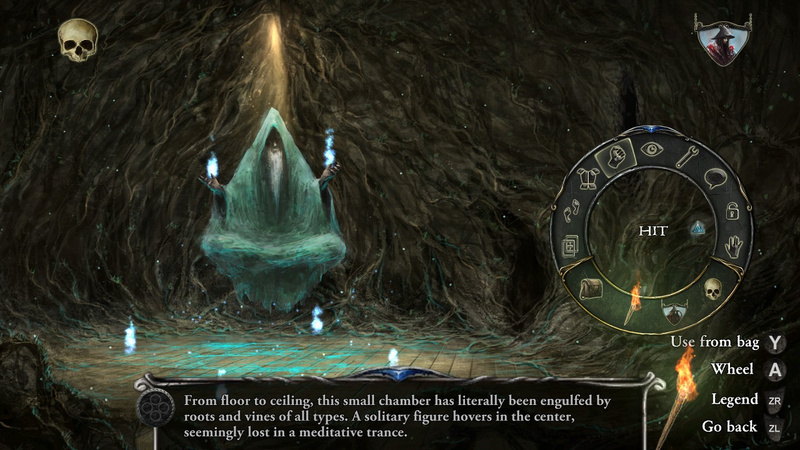 For me personally, Shadowgate's visuals are timeless and don't lend themselves well to these realistic 3D remakes. Steam gives it a 9/10, but this site gives it a 6/10... what the hell? This site needs more than one person to review a game, because subjective opinions are really giving games unjust scores here on NintendoLife. The same with MetaGal; it got a 3/10. How can someone seriously give a game of that quality a 3 outta 10? Let a Mega Man fan review that game and tell the people what's what. It's getting so you can't trust any website for an honest review, especially with new games. You have to see the game play for yourself, because almost all newer titles are touted at an 8/10 or above to push sales. Website reviews are bought and paid for. People with little following on YouTube are much more trustworthy... not so much the big shots who get stuff for free from a company.